Stacy Horn » Blog Archive » Save me! And by “save me” I mean read all the books I need to read and give me the highlights. I can’t believe how many books I’ve read, skimmed, glanced at, while writing this book about the Duke Lab. And everyday I find more. Today I decided I must read this book written by Chris Carter (creator of The X Files). It’s called Parapsychology and the Skeptics, and I read an excerpt and it just looks like one that should not be missed. Then there’s another one called Extraordinary Knowing: Science, Skepticism, and the Inexplicable Powers of the Human Mind, by Elizabeth Lloyd Mayer, who died right before it came out. I’ve started and need to finish: Entangled Minds by Dean Radin, a physicist, because I need to understand the quantum issues, Parapsychology: The Controversial Science by Richard Broughton, the title explains why I need to read it, and Memoirs of a Psychic Spy by Joe McMoneagle, because he’s been answering some questions via email, and they’ve been some pretty interesting answers. So yeah. Feeling overwhelmed. And this is all for the epilogue that may only amount to a few pages. I just want to cry. I can’t take it anymore!! All of you out there writing books (except for me): STOP. 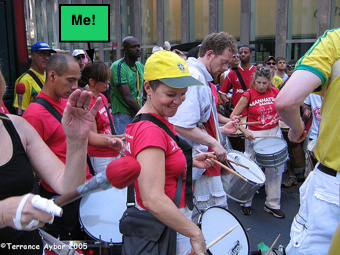 I found the picture of my band on Flickr. God, I’m vain. But I love finding pictures of myself. Reading your list of books just gave me a headache. Weirdly, the one about physics is the easiest one to read.